Created from the resurgence of interest in breeding sweet peas for scent, Modern Grandiflora sweet peas provide the best of all worlds for the gardener. They have larger petal size and stem length, combined with exceptional scent that has been inherited from their older cousins, the heirlooms or 'grandifloras'. Lathyrus odoratus 'Midnight' is very special variety of sweet pea, seed of which is seldom available. This Modern Grandiflora produces beautifully formed scented blooms of dark Crimson, almost black. An amazing colour in addition the flowers are the largest I have seen, almost twice the size of a regular sweet pea. This exceptionally fragrant variety has stems that are almost twice the length and so are perfect for cutting. The Spencer varieties were originally developed by Silas Cole, head gardener for the Earl of Spencer at Althorp (the family of Diana, Princess of Wales). Spelling of this variety has varied over the years but is now standardised as High Scent. Traditionalists often complain that modern breeding has resulted in sweet peas with less scent. This is not entirely true. Many of the Spencer sweet peas are wonderfully fragrant but it’s a question of choosing the right varieties. As a general rule lighter coloured varieties are better scented than the strong colours. The name Spencer was introduced in 1901 by Silas Cole, the head gardener to Earl Spencer at Althorp. The ‘grandiflora’ or ‘old-fashioned’ sweet peas have come back into popularity in recent years. 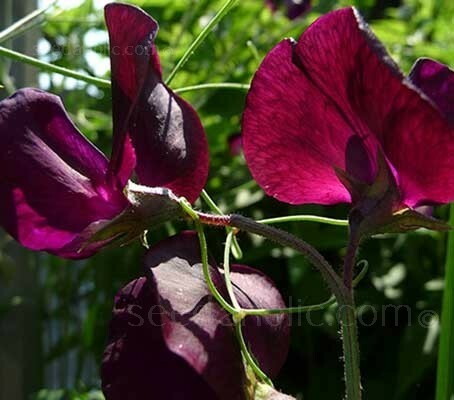 Modern sweet pea varieties are only moderately scented and for intense full bodied perfume, many seed breeders have gone back to the pre-Spencer types. The flowers are smaller and less frilly than the Spencers but all varieties are beautifully fragrant. The name Grandiflora was coined by Henry Eckford in the 19th century for his hybrids which were a great improvement on the wild Sicilian species. Created from the resurgence of interest in breeding sweet peas for scent, Modern Grandiflora sweet peas provide the best of all worlds for the gardener. They have exceptional scent, inherited from their older cousins, the heirlooms, combined with larger petal size and stem length.